I've wanted to get a photograph of the flamingos in the Free Zone for some time. I'm either there late in the night, or I forget my camera during the day. Yesterday, I had my camera with me and I managed to find a couple of them. I looked everywhere for the others and all I could see were seagulls and a dog! It's not the shot I wanted, of them all together on the ground feeding and resting, but I'm sure you will agree that this is very special indeed. Click the image for the original version to get a better feel of their flight. The quality is not great as I had to jump out of the car, focus and shoot before they flew past the city's skyline. I wonder how they survive here! Our water front is a disaster! The original version is better. 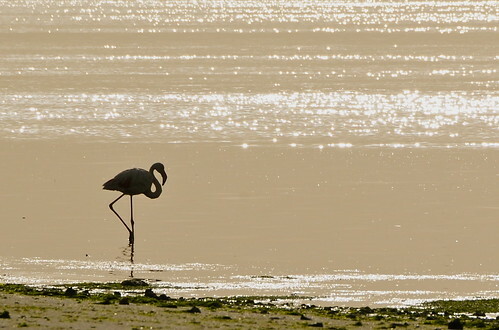 Loved the sight of the flamingos and of the sea-gulls enjoying themselves, in the water. Hey, btw....you can see our office in tat pic if you do a zoom. It's embarrassing. If I told you how much rubbish I saw taking these shots, everyone would think I'm exaggerating! It's in a terrible state. Glad you opened the larger version. Do however open the larger version. It's nice seeing the line of birds against the skyline of the city. I've always wanted to shoot some flamingos(on camera).